Our PLATTERS & BUFFETS service is very popular. We can cater for your office party, family or group event − large or small. We’ll deliver your platters and buffets for free anywhere in and around the Worcester area*. Just give us a ring to discuss what you need and how many people you need to cater for. 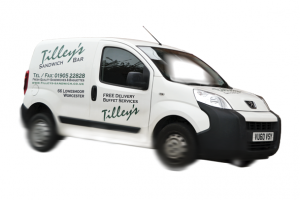 Then relax and we’ll do the rest − freshly made here, the best ingredients, and delivered to your door in the new Tilleys van − toot toot! £5 min order in Worcester City, £10 min order − within 2 miles. We need 24 hours notice when ordering a buffet please. ★ We now offer Gluten-free bread. ★ Please tell if you have any food allergies or intolerances when you make this order.